Thermal hydrolysis is a process used for treating industrial waste, municipal solid waste and sewage sludge. Thermal hydrolysis is a two-stage process combining high-pressure boiling of waste or sludge followed by a rapid decompression. This combined action sterilizes the sludge and makes it more biodegradable, which improves digestion performance. Sterilization destroys pathogens in the sludge resulting in it exceeding the stringent requirements for land application (agriculture). In addition, the treatment adjusts the rheology to such an extent that loading rates to sludge anaerobic digesters can be doubled, and also dewaterability of the sludge is significantly improved. The first full-scale application of this process for sewage sludge was installed in Hamar, Norway in 1996. Since then, there have been over 30 additional installations globally. Thermal hydrolysis reactors at Blue Plains in 2016. 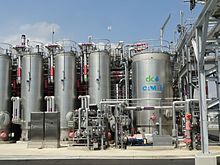 Sewage treatment plants, such as Blue Plains in Washington, D.C., USA, have adopted thermal hydrolysis of sewage sludge in order to produce commercially valuable products (such as electricity and "class A" biosolid fertilizers) out of the wastewater. The full-scale commercial application of thermal hydrolysis enables the plant to utilize the solids portion of the wastewater to make power and fine fertilizer directly from sewage waste. The city of Oslo, Norway installed a system for converting domestic food waste to fuel in 2012. A thermal hydrolysis system produces biogas from the food waste, which provides fuel for the city bus system and is also used for agricultural fertilizer. ^ a b Barber, Bill; Lancaster, Rick; Kleiven, Harald (2012-09-01). "Thermal Hydrolysis: The Missing Ingredient for Better Biosolids?". Water World. 27 (4). Retrieved 2014-05-24. ^ Neyens, Elisabeth; Baeyens, Jan (2003). "A review of thermal sludge pre-treatment processes to improve dewaterability". Journal of Hazardous Materials. B98 (1–3): 51–57. doi:10.1016/S0304-3894(02)00320-5. ^ Skinner, Samuel; Studer, Lindsay; Dixon, David; Hillis, Peter; Rees, Catherine; Wall, Rachael; Cavalida, Raul; Usher, Shane; Stickland, Anthony; Scales, Peter (2015). "Quantification of wastewater sludge dewatering". Water Research. 82: 2–13. doi:10.1016/j.watres.2015.04.045. PMID 26003332. Retrieved 2017-02-23. ^ Halsey, Ashley (2014-04-05). "DC Water adopts Norway's Cambi system for making power and fine fertilizer from sewage". Washington Post. Retrieved 2014-05-24. ^ Berkowitz, Bonnie; Lindeman, Todd (2014-04-05). "From Toilet to Turbine". Washington Post. Retrieved 2014-05-24. ^ "Food Waste to Fuel Oslo's City Buses". Environment News Service. Lincoln City, OR. 2012-03-23. Retrieved 2014-05-24. Kline, Michele; Gurieff, Nicholas; Bruus, Jacob (2011-04-01). "Thermal Hydrolysis System Helps Increase Biogas Production". Water World. PennWell Publishing. Retrieved 24 May 2014. This page was last edited on 10 March 2019, at 11:40 (UTC).